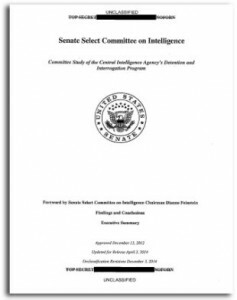 Dianne Feinstein’s release of the Senate Intelligence Committee’s report on the CIA’s use of torture is a stand-up, gutsy move likely to endure as the most important act of her long career in Congress. 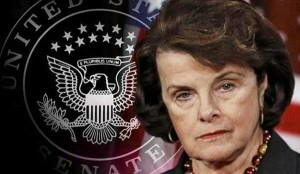 As a political matter, the easy part for Feinstein was to defy a torrent of inflammatory attacks and threats from conservatives accusing her of treason and worse; as a personal matter, the harder part was to stand up to howls of protest from the national security establishment and other betting sitesBeltway elites, two groups of whom she long has counted herself a member. And, oh yeah, she did the right thing for the country, too. Under enormous pressure, Feinstein could have punted, mumbled about bipartisanship and played it safe by letting Republicans water down the report or bury it for good after she loses her committee chairmanship when the new Senate convenes. Such an option was most likely a non-starter for someone of her self-regard, but that she ultimately did not choose it may well stand as the greatest legacy of the 81-year old Senator’s years in Washington. Middle of the road: yellow stripes and dead armadillos: Feinstein’s entire career has been an earnest search for the elusive political middle. This time, she found there isn’t one. Throughout the compilation of the report, the ever-cautious Ms. Feinstein was torn between her allegiance to and admiration for those who do the nation’s difficult intelligence business and the belief by her and other Democrats on the panel that there must be a public accounting of the C.I.A. conduct to prevent future occurrences. As recently as Friday, Ms. Feinstein appeared to be having new reservations about releasing the report after being warned by Secretary of State John Kerry, her former Senate colleague, of possible violence overseas and risks to American hostages. An A+ paper: From start to finish, and throughout the tedious process to produce and surface it, the report has Feinstein’s hardest working-Convent girl-in-the-class imprint all over it. Five years. Six million documents, 6,000 pages. A 500-page summary, ferhevvinsake. Not to mention reams of grisly and graphic detail, not surprising from a politician (and the daughter of a surgeon) who’s never left the gruesome to the imagination, from her countless mentions of feeling the bullet holes in Harvey Milk’s wrists to the “brain matter spattered on the canned goods,” a phrase she used for years in describing a long-ago grocery store robbery she said helped make her pro-death penalty. 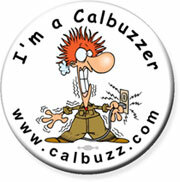 For Feinstein, the specter of losing control of such a singular project, by caving in to pressure not to release the report before she loses control of the Intelligence Committee, surely pushed all her control freak buttons. How dare you?! 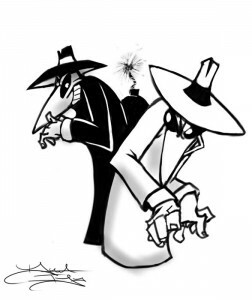 No one will ever know for sure, of course, but Feinstein may not have pushed quite so hard for the release of the report if the CIA’s spooks hadn’t decided to spy on her and her staff members. Some veteran DiFi watchers (we name no names) believe she may have reacted with such outrage for the simple reason that the CIA’s alleged computer incursion touched her?personally. “It’s all about Dianne,” went a familiar refrain during her City Hall years, often accompanied by the rolling of?eyes. 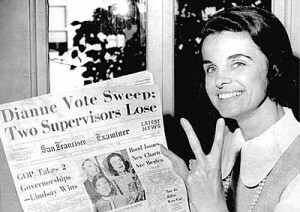 What goes around comes around: Several years before she won elected office in 1969, Feinstein first came to public attention in San Francisco by conducting her own private investigation of conditions in the women’s county jail. Then a young and bright Pat Brown appointee to California’s women’s parole board, Feinstein wrote up her findings about inhumane conditions in the local lock-up in a series of articles that the old Hearst Examiner splashed across its front page for several days. It’s a bit of history worth recalling, at least for those who like their political narratives neat and tidy, as she caps her career half a century later by exposing far more barbarous conditions in a far more evil system of government jails that, thanks to her best efforts, are secret no longer.